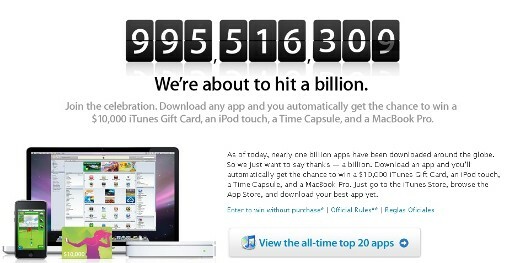 Apple has set up a countdown clock to build anticipation around the build up to the one billionth download of an Apple app. The clock, online at www.apple.com/itunes/billion-app-countdown, accompanies a sweepstake competition for a $10,000 iTunes Gift Card, an iPod touch, a Time Capsule, and a MacBook Pro. Apple has included a list of its 20 all-time top apps (10 paid and 10 free).